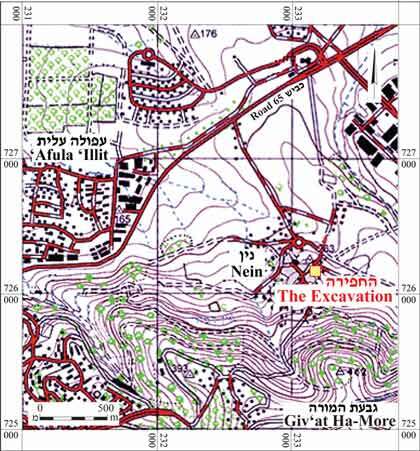 In March 2007, a salvage excavation was conducted in the ancient nucleus of Nein, located in the Jezreel Valley (Permit No. A-5049; map ref. 233082–97/726172–97). The excavation, on behalf of the Israel Antiquities Authority, was directed by F. Abu Zidan, with the assistance of Y. Lavan (administration), A. Hajian (surveying), H. Smithline (photography), Y. Gorin-Rosen (glass), L. Porat (pottery restoration), H. Tahan-Rosen (pottery drawing) and G. Bijovsky (numismatics). The author wishes to thank P. Gendelman, W. Atrash, N. Feig, D. Avshalom-Gorni and A. Berlin for assisting in identifying the pottery and preparing the report. 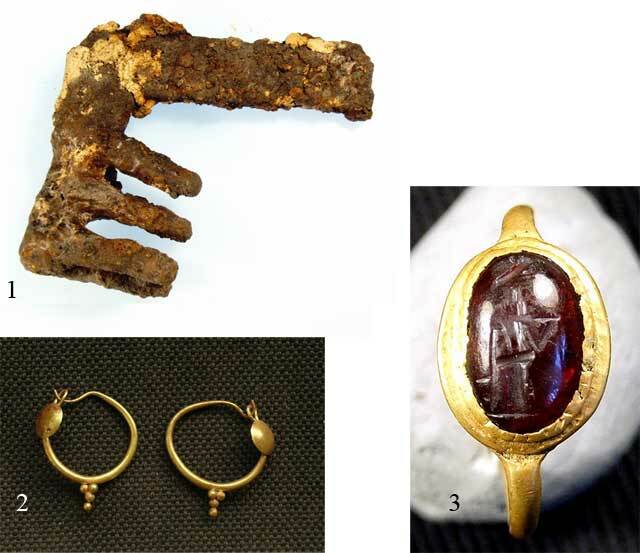 Special thanks to A. Peleg who helped in identifying the gold rings. The site is located in Nein, in the southeast of the Jezreel Valley, at the northern foot of Giv‘at Ha-More, c. 2 km north of ‘Afula ‘Illit (Fig. 1). Numerous archaeological excavations were previously carried out at the site, yielding habitation levels from the Intermediate Bronze Age (Covello-Paran 2011; Mokary 2009a), a hiding refuge from the Roman period (Oshri 2000:28*), wine presses from the Byzantine period (Mokary 2002) and architectural remains dating to the Early Islamic, Crusader, Mamluk and Ottoman periods (Abu-‘Uqsa 1997; Porat 2000:6*; Abu Raya 2006; Amos 2008; Mokary 2009a; Mokary 2009b; Avshalom-Gorni 2011). 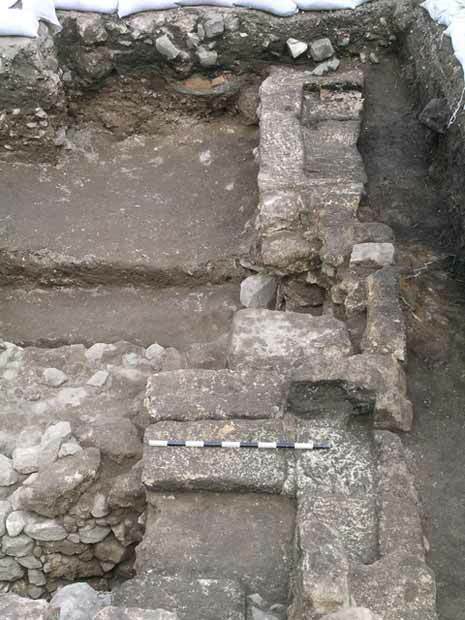 The excavation (40 sq m) was conducted in the heart of the village, c. 70 m southeast of the Byzantine church, which was later given the name ‘The Widow's Son Church’. 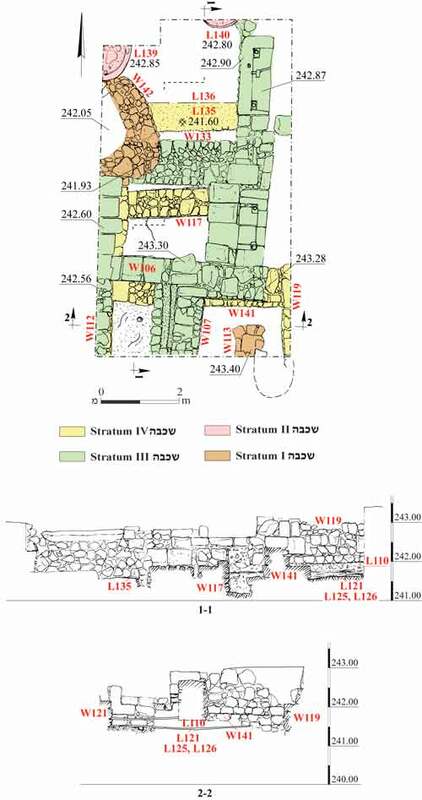 Architectural remains attributed to four strata (IV–I; Fig. 2) were exposed: an Ottoman building (Stratum I; Fig. 3), two Mamluk tabuns (Stratum II), a dwelling dating to the Early Roman period (Stratum III) and a Hellenistic structure (Stratum IV). Stratum IV: The Hellenistic Period. The place was first inhabited in the Hellenistic period. A dwelling comprising three architectural units was exposed. The walls of the structure, founded on the bedrock, were built of dry construction with roughly hewn limestone and fieldstones preserved to a maximum height of 4–5 courses (1 m). On the floors, made of packed crushed chalk, was an accumulation of soil containing Hellenistic-period pottery and two coins from the reign of Alexander Jannaeus, dating to 80/79 BCE. As no openings or passages were preserved between the architectural units, it was difficult to determine the relationship between them. The building ceased to be used at the end of the first century BCE or beginning of the first century CE; the reason for this is unclear, as there was no apparent evidence of damage or destruction. Stratum III: The Roman Period. Remains of a massive building consisting of three rooms and a courtyard were discovered atop the wall remains of the Hellenistic period. 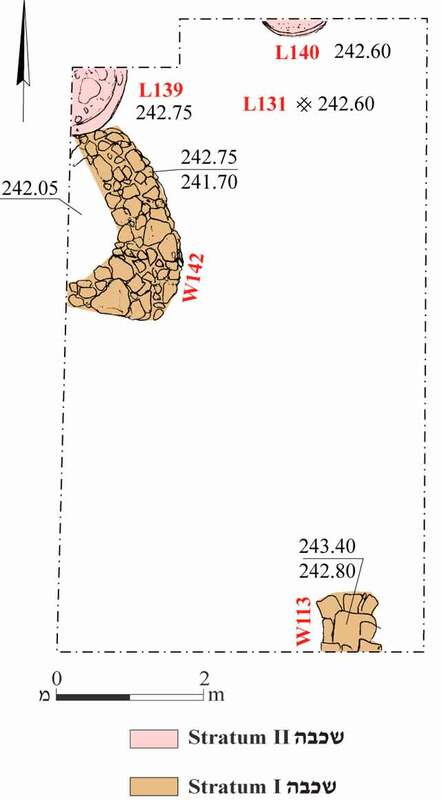 The structure was well-built of medium and large ashlars (wall thickness c. 0.8 m; Fig. 3). Its floor, paved with large stone slabs, was only partially preserved in the central room. The structure was destroyed in the second half of the first century CE by a conflagration, in which it collapsed on its occupants, as evidenced by a layer of ash and charcoal that covered fallen building stones and burnt skeletons that were found below the rubble. The destruction might be relate to the events of the Jewish War against the Romans, which took place in the Galilee in 66–67 CE. The destruction layer contained fragments of pottery vessels, mainly imported ceramics such as terra sigillata, fragments of fine quality glassware belonging to a wide variety of shapes, metal objects that included an iron key (Fig. 4:1) and gold jewelry—earrings decorated with a grape cluster (Fig. 4:2) and a ring inlaid with carnelian (Fig. 4:3)—all dating to the Early Roman period (first century CE). These artifacts were likely the property of wealthy families and of representatives of the Roman government in the country. Stratum II: The Mamluk Period (Fig. 5). Few remains from this stratum survived due to the construction of the Ottoman-period building. Two circular tabuns and pottery sherds dating to the fourteenth century CE were exposed in the northern balk of the excavation. Stratum I: The Ottoman Period (Fig. 5). A multi-story building dating to the Ottoman period that stood where the excavation took place was demolished for safety reasons shortly before the excavation. Its remains included wall foundations and pottery sherds that were found on the surface throughout the excavation area. Abu-‘Uqsa H.1997. Nein. ESI 16:58*. Abu Raya R. 2006. Nein. HA-ESI 118. Amos E. 2008. Nein HA-ESI 120. Covello-Paran K. 2011. Nein-‘En Ha-More (N). HA-ESI 123. Oshri A. 2000. Nein. ESI 20:28*–29*. Mokary A. 2009 (A). Nein. HA-ESI 121. Mokary A. 2009 (B). Nein. HA-ESI 121. Porat L. 2000. Nein. HA-ESI 111:6*–7*. 3. Remains of the Roman building, looking north. 4. An iron key and gold jewelry. 5. Stratum I, II, plan.